I know there are a lot of people excited that fantasy golf is coming back to THP and this year we are in for a great time. THP has once again partnered with a service that will make this a phenomenal year and is giving away prizes are awesome. You must be a 2019 Albatross Club Member to participate. This year THP has partnered with a wonderful charity helping children and as a community we can continue to make a difference. For more information on this, click here. 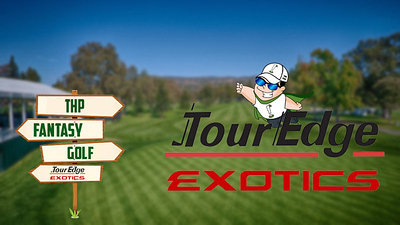 The winner of THP Fantasy Golf, will win a full bag of Tour Edge Exotics golf clubs. Anything in their lineup you choose, can be yours and all 14 clubs will be given as a prize. There will also be quarterly (segment) prizes awarded as well. So if you miss a week and/or are falling behind, never fear as we have prizes happening all of the time. You must be a 2019 Albatross Club Member to participate in THP Fantasy Golf. Your Team Name MUST be your THP Forum Screen Name exactly. Failure to abide by above will result in your team being removed from the league. The league is open (to start with) to 250 players and there is no entry fee to be involved. Click the button at the top of the page that says Fantasy Golf. 1. Click on the register button and fill out the registration form. 2. Once registration is complete (the password is AlbatrossTHP), you will be sent an email. Click the link in the email to activate your new account. 3. After account activation, sign into your account below. 4. Once logged in, you can create your team by entering your team name and the league password. The league password for the THP fantasy golf league is “AlbatrossTHP”. 5. Once your team is created, you will need to select your golfers and click the save button after your selections are complete. You will select golfers before each tournament of the PGA Tour season. The deadline to select golfers will be the tournament start date and time. If you sign up late or miss a few weeks, its no big deal, jump in whenever you can. It happens to everybody and you never know how a few weeks end up going your way and you are right in the thick of things. This year the Majors are worth double money again, so there is always time to catch up. Plus with segment prizes available, you can still win some killer Tour Edge gear. You can select anybody in the tournament as part of your roster. It is your job to select 10 golfers to compete each week. Each golfer is assigned a dollar amount and you will have a salary cap of $2 million dollars to set your roster before each tournament. You will only be able to choose a golfer 8 times during the season. You must select a minimum of 7 golfers each week on your roster. Scoring is done based on money earned. Depending on how someone finishes, their prize money is the indicator on how your team did. Last year was a lot of fun. Hoping to be better about getting my teams in on time. It killed my chances last year. Loved playing last year but fell off in the 2nd and 4th quarters. Hopefully I'll be better at remembering to get the lineups in week to week this year. Missed last year but ready to go this year! Just signed up! Loved playing last year, hopefully some better results this year. Well I am in. Phone calendar set up for reminders already. I am in. Hope I can do better than I did in football this year. In! What an awesome prize! Here we go again! 3rd time the charm? Pumped for the new year! Never played fantasy golf... lots of hockey and football before, but this will be new! I’m excited to give it a try! Another great season coming up. Really looking forward to it! !